Family: Araliaceae Origin: Australia, New Guinea, and Java. Naturalised in South East Qld and other places. 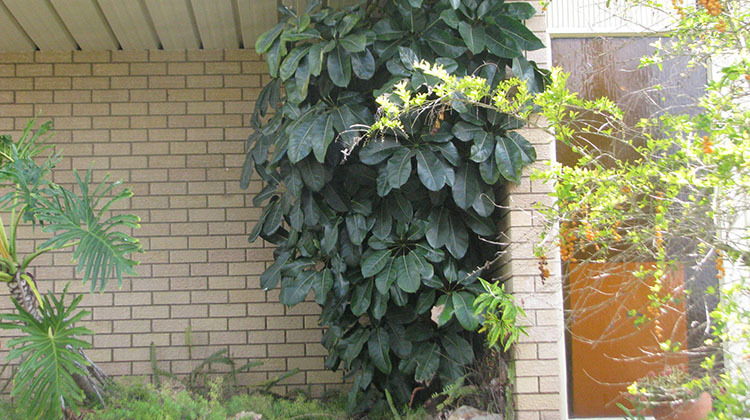 While this is an Australian native, the Umbrella tree or Schefflera actinophylla can end up being a nightmare in cultivation and in some applications. 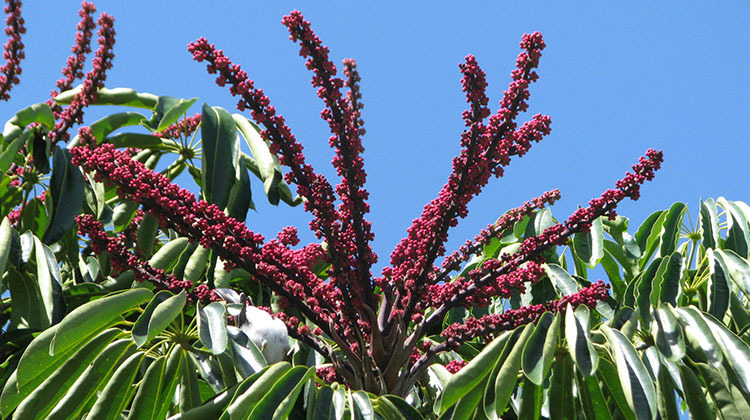 Knowing where to plant this beauty can help you avoid many of the common problems that are associated with the Umbrella tree. But, despite its invasive qualities (which we’ll mention lower in this article), It is a good native tree in some ways. Many local animals rely on this tree for its nectar rich flowers and fruit, and the leaves are enjoyed by native tree-kangaroos. 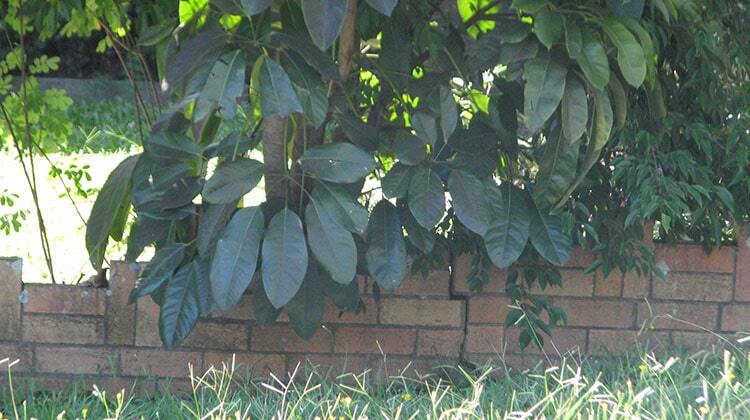 In parts of the world where this tree can’t grow outside, it’s a very common houseplant. This evergreen tree is unique in appearance. It’s a smaller tree, reaching about 15 metres in height. In the wild, it’s often found growing literally ON other trees (epiphytic), which explains its aggressive root system. 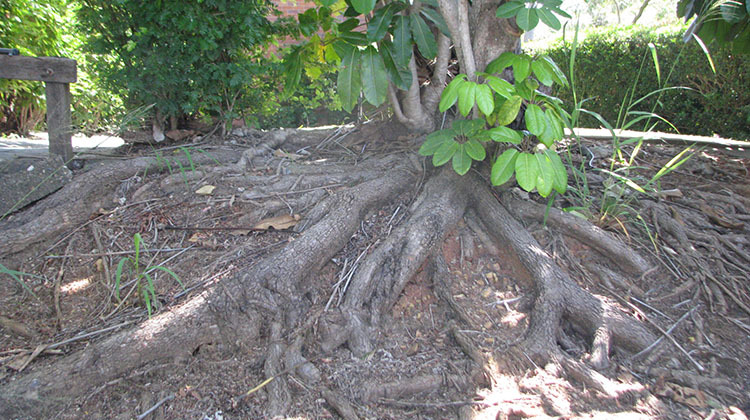 The adventitious roots are required for it to reach soil. It bears its fruit high above its canopy on 2 meter high racemes. Overall, the Umbrella tree has a round form at the top. This tree usually forms a few trunks per plant. The trunk is light grey or tan and slightly cracked. It’s usually gnarled a bit as well. As new trunks gain girth the trunk widens, contributing to the damage this tree causes to nearby structures. The juveniles have green stems with lenticels and prominent leaf scars while aged leaders turn grey. There is little branching due to strong apical dominance in each leader. This can make it difficult for homeowners to restrain their height, since they can only be lopped. The flower body of the plant is probably its most recognizable attribute. The flowers themselves aren’t especially showy, but they are borne on large racemes and held high above the entire tree like a fountain. Racemes are light red in color. They usually have 12 petals though this can vary from seven to eighteen. Each one measures from 3-5mm long. They have the same number of stamens as petals. The leaves are thick and green and are compound, forming in groups of seven. The fruit are brightly colored yellow and red or sometimes purple and are very attractive to wildlife. They too are held high above the tree’s canopy on the same racemes that the flowers were on. Birds and other animals are commonly found feeding on the fruit, where the seed inside passes through the digestive tract and is spread as the animals defecate. Umbrella trees have incredibly invasive root systems. They have enormous strength and consistently cause damage to structures. 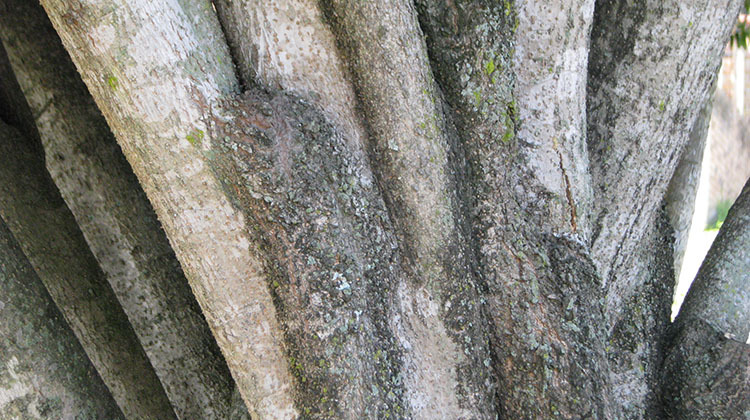 Both the trunk flair and root collars are formed above ground, giving some hint at the root structure below, as the following photo demonstrates. Schefflera actinophylla is easily started from fresh seed, with some scarification to help speed up the process as the seeds are spread around by animals after they eat the fruit that contains it. Cuttings are also easily taken and rooted. We recommend tree removal in most cases. I have just purchased a Villa unit in Umina Beach Central Coast NSW and there is a large 10 meter Umbrella tree over 20 years old located next to metal fence between me and my neighbours. It’s approx 5 metres away from buildings. There are large roots growing across the grass an lead to under the ground and building. Hi Steele. It should be removed for several reasons. Firstly, you are right to be concerned about the building. From an engineering point of view it is of high risk of damaging the slab. Secondly, it’s an environmental weed. The risk of damage to the structure should be convincing enough, though. It’s not just the proximity, the species has robust roots well known for causing damage. It’s very unlikely to form roots 10m below ground level. Hi Dennis. Regardless of its weed status, you’ll regret it for the damage its roots invariably cause. We have a large umbrella tree to be removed. After cutting it down what is the best and most effective Poisen to use to kill it. David, I have a large, 25 year old umbrella tree in my yard in coastal Southern California. This year is the only year that it has bloomed with the red branches and seed pods at the top. Is this unusual or is this common for a tree this old? My husband and I bought an umbrella tree from… Can you believe… Walmart? We brought it home in the back of our VW Beatle back in 1980!! This tree was purchased shortly after we got married and while we live in Wisconsin, it had to be an indoor tree in the fall/winter. This tree. Was viewed as a symbol of our marriage. Then a horrible situation occurred and I didn’t take proper care of our tree. It became very gangly with few leaves that managed to stay on the branches. I did a horrible thing and threw it out. My husband was crushed and I too regretted that moment of intolerance. I desperately want to get a new umbrella tree as a gift for my husband. We have survived the loss of our son, and everything has great meaning in our lives. In a world of grief and pain, we must start our lives over. How much it would mean to start our new journey with another umbrella tree!! Our symbol of love!! Is there someone who could help me to gift my husband with this special tree??? Hi Jeannie. You can buy seeds from Austrahort. Good luck, they aren’t difficult to propagate. Hi David, we got umbrella tree cut and stump is still in there next to our wall. I have been applying Glyophosate 360 from last 3 weeks every week (undiluted). Now the stump is secreting some type of glue from edges and its turned pale yellow. Is it a indication of stump is getting weak and will dye? Hi David. Can you tell me if there are any legal requirements in removing the umbrella tree from my back yard? Thank you. 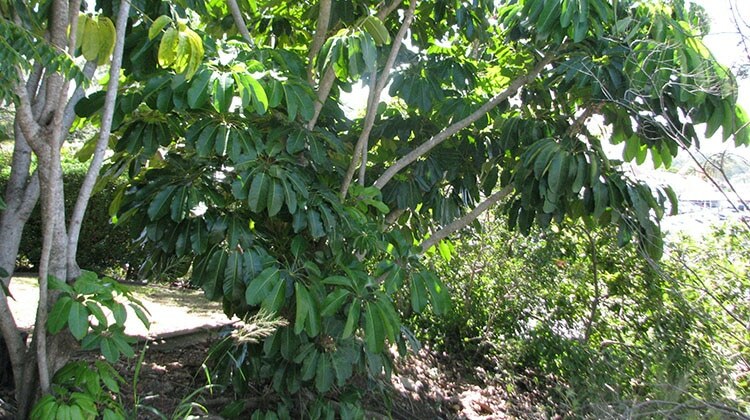 In Queensland umbrella trees are declared environmental weeds so locally there are no legal issues to prevent it being removed.